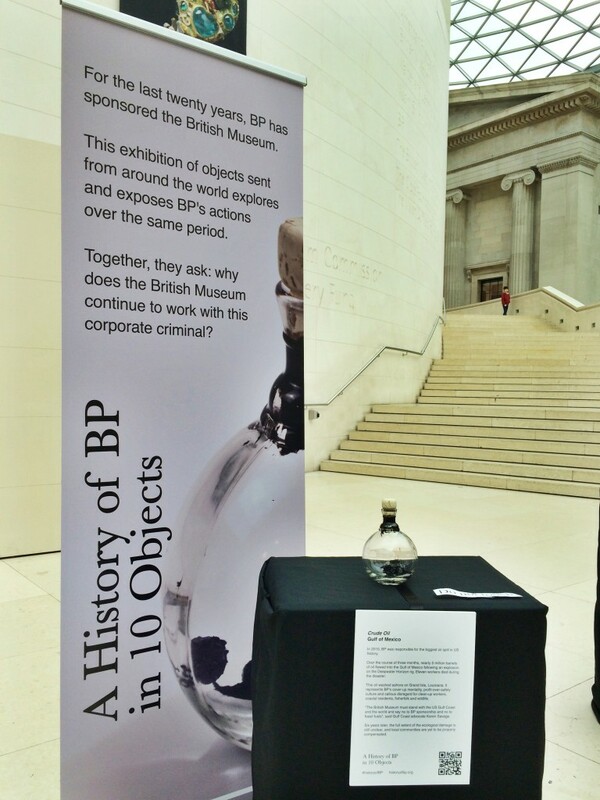 BP sponsors an exhibition of objects from Iraq. We respond. – BP or not BP? Theatrical action group BP or not BP? have released the following statement in response to the British Museum’s announcement this morning that a major upcoming exhibition featuring objects from modern-day Iraq will be sponsored by the oil company BP. The announced exhibition – I am Ashurbanipal: king of the world, king of Assyria – will open in November 2018. In 2002, before the last Iraq war, a government memo revealed that BP was ‘desperate to get into Iraq’. Now campaigners believe BP is shamelessly profiting from Iraq’s fascinating history as well as its oil. BP or not BP? have staged fifty protest performances at oil-sponsored cultural institutions since 2012, including more than thirty at the British Museum. Thank you to the artists taking part in the show for taking action, against oil, companies profiting from war, and death like, BP, we shouldn’t let them use, culture as an campaign for investment to gain people’s acceptance of the horrible things the do by taking people’s lives in order to be profitable and make money.